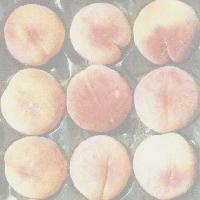 A white-fleshed peach with wonderful aromatic flavor. You have not experienced all that life on earth has to offer, until you tast this peach. Medium to large in size, semi-clingstone, with soft flesh. Raritan Rose is greenish white on the outside with a red blush. The flesh is cream white. Ripens late-July in the Willamette Valley.